Two years after a deadly nationwide meningitis outbreak linked to a compounding pharmacy in Massachusetts, Governor Patrick signed off on a new bill that will better define the state’s authority in the regulation of compounding pharmacies. Compounding pharmacies mix customized medications, and without proper regulation, incidence of potential harm can be high, as seen with the 2012 meningitis outbreak. On July 10, Governor Patrick signed the Compounding Pharmacy Oversight Bill into law to address the “gray area” between state and federal oversight of pharmacies. The new law tightens licensing and labeling requirements and increases fines for violation of state rules. Additionally, it reorganizes the board that regulates pharmacies and requires the board’s inspectors to be trained in sterile and non-sterile compounding practices. 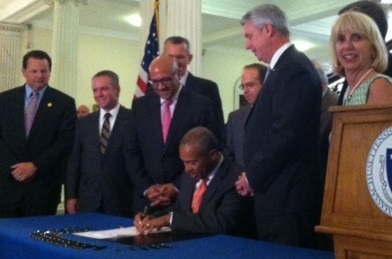 After the bill signing, Governor Patrick stated that this new measure puts Massachusetts ahead of many states. Emergency inspections of compounding pharmacies increased after the 2012 outbreak, but this new law creates a means to permanently regulate these facilities and eliminate ambiguity between state and federal roles. MPHA strongly supports this new law and hopes other states will soon follow.